We recently had the opportunity to collaborate with Elan Hickler, who recorded the samples for our Grand Kalimba library, to develop his music box samples for Kontakt 4. 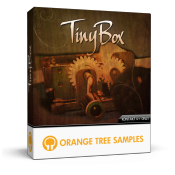 TinyBox features nearly three octaves of tines, 14x round robin, and clean / dirty sample modes. If you're looking for a unique sound for your music, TinyBox offers a great addition to your signature sound.